Join us for an INTERACTIVE COMEDY MURDER MYSTERY DINNER SHOW at The Estate at Sunset Farm! Solve a hilarious crime while enjoying appetizers, drinks and a delicious dinner. 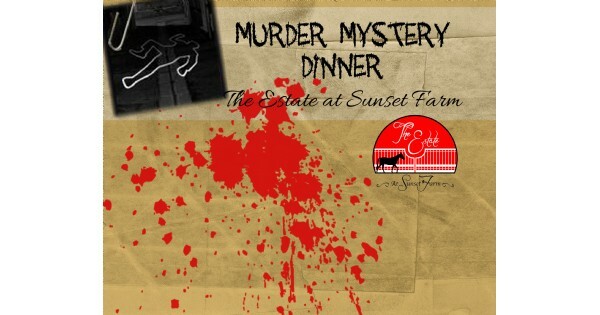 Join us for an INTERACTIVE COMEDY MURDER MYSTERY DINNER SHOW at The Estate at Sunset Farm! Solve a hilarious crime while enjoying appetizers, drinks and a delicious dinner. Just beware! The culprit is hiding in plain sight somewhere in the room, and you may find yourself as a Prime Suspect before you know it! Ticket Price Includes: Beer & Wine, Appetizers, Salad, Main Course, Dessert, Non-Alcoholic Beverages, Murder Mystery Entertainment, & A Prize Package For The Top Sleuth! The show is rated PG-13! The age limit is 15 years old, due to mild adult content, swearing, and loud noises. The show takes place all around you! DRESS CODE: Our dress code is “Saturday Night Downtown”. Find more events like "Murder Mystery Dinner at The Estate"
The Estate at Sunset Farm provides an incomparable backdrop for truly remarkable events.